I've been a little busy, a tad distracted, the past few weeks: publishing a series of books for children, plus my first novel (if you missed the launch, click here for the website, and here for the press kit.) There have, no doubt, been a few major launches that have missed my ears, and one or two concerts that yes, I should have covered but didn't. 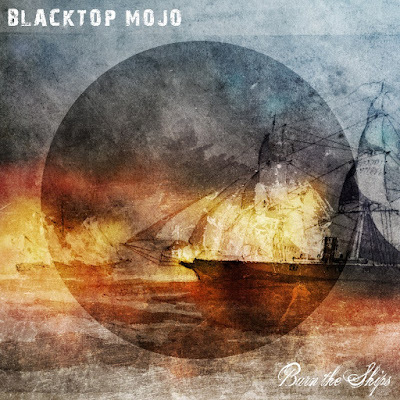 But I want to make sure that nobody misses this one: to be released on 10th March, it's a new, full-length album from Blacktop Mojo titled "Burn The Ships" (they self-released their first album, "I Am", in 2014). A mix of hard rock, melodic metal rhythms/bass/guitar, bluesy-rock and some beautiful acoustic work, I know this album is going to be on repeat in my house for a very long time. It's seriously, seriously good. The album has the kind of artwork that would have me picking it up off the shelf in a record store, even if I'd never heard them before. Sometimes an album cover will still do that. Check out a video of them performing recently on Good Morning Texas. They also recently won a competition to open for Bon Jovi, before a huge crowd in Dallas at American Airlines Center. Here's an example: yes, it's a cover, but it's a really good cover (and here's another one): and then wait, impatiently, to get your ears on a copy of Burn The Ships on March 10th (click that link for a pre-order). Blacktop Mojo come from Palestine, Texas, and are vocalist Matt James, drummer Nathan Gillis, lead guitarist Ryan Kiefer, guitar player Kenneth Irwin, and bassist Matt Curtis. To find out more, check Blacktop Mojo's website and Facebook,.. plus several videos on YouTube, and when the album is released, listen to it, end to end, several times. You might find it on repeat in your house, too.